First and foremost, LOOK AT THAT COVER. This has got to be, hands down, the most beautiful cover I have ever seen. I know they say not to judge a book by its cover, but damn, I would’ve given this book 5 stars just by looking at that wonderful cover. The content gave this cover justice. Ten Thousand Skies Above You takes place just 3 months after A Thousand Pieces of You and Marguerite fills the gaps pretty quickly within the first few chapters of the book and I’ve got to admit that Claudia Gray’s writing in Marguerite’s perspective has made the entire series a lot easier to understand due to her quirkiness and less scientific terms, even if the entire plot revolves around the world of science. You can expect a lot of reminiscing from Ten Thousand Skies Above You since many references are made that occurred back in A Thousand Pieces of You that really really really make you feel so sentimental and nostalgic for the first Firebird book. 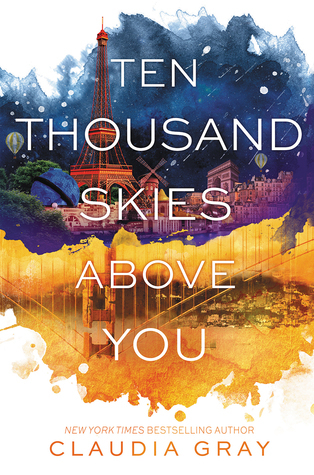 From the futuristic Londonverse all the way for the royal Russiaverse, Ten Thousand Skies Above You will make you feel like you’ve never departed from A Thousand Pieces of You that was published a little more than a year ago (you can read our joint review of that here). In terms of plot, this is much harder to absorb than the previous book. I’ve got to say, even if Marguerite’s narration was relatively easy to flow with, some scientific terms left me lost (but don’t worry, Marguerite seems to be just as confused as I was). The jumps between dimensions happen more frequently here than it did in A Thousand Pieces of You, so it takes time to absorb and compartmentalize one version of one character from another. I honestly have no idea how I was able to finish it within 20 hours, but I guess that’s what beautiful writing and excellent plotting combined do. I really enjoyed reading this book! This was the novel that got me back on the reading saddle after being in a horrible reading slump for the past few months due to university requirements and other responsibilities alike. I’m giving this book 5 stars and I’m pretty sure you know why. This deserves a special place in our Recommendations and in my 10/10 book list. Definitely can’t wait for Firebird #3! Day 1 of my mourning period starts from here on out.